10 20 30 Rule for PowerPoint: Useful or Useless? – Wonderful analysis and commentary on one of the core concepts I teach in my Powerful Presentations learning programs. Enterprises and Social Media: 5 Must-Haves – Ravit Lichtenberg provides a tidy list summarizing what organizations must do to get their social media game on. More Talk, Less Chalk: Lexically Sparse Slides Improve Recall of Taught Material – New study reinforcing what we have been telling folks for years in our presentation skills course: "… use of presentation software, whereby information is simultaneously delivered verbally and visually, risks overloading students' working memory and impairing learning." Just wanted to post a note that I will be on travel the next two weeks, so the posting here may be even slower than usual. I will be in Singapore delivering Web 2.0 & Enterprise 2.0 Foundations masterclass July 17-18 and delivering a keynote and masterclass at KM Australia July 21-23. My keynote at KM Australia is entitled Abandon Your Content Management System: KM in the Age of GooTube. I hope to get a synopsis of it up here as a post soon. I’m looking forward to being down-under and I hope they are having a mild winter so I can enjoy some of my short stay. If you will be in Singapore or Australia, it’s not to late to register (I think). See you there? Today I had the great pleasure of presenting a session on Web 2.0 and Enterprise 2.0 at MIX08 Italy in Milan. I was there as a guest of our strategic partner in Italy and Germany, Reply. 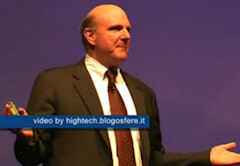 The day was kicked off with a keynote by Microsofy CEO, Steve Ballmer (see videos here). There are other posts about his comments on Yahoo! So I thought I would just share some of my thoughts on the other parts of his talk (and the follow-up Q&A). Software + Services is the solutions theme for Microsoft. This is there take on how they will help us serve the C+C+C from above. Despite Ray Ozzie’s release of Live Mesh and some observations that MS finally sees that software is dead, Steve stressed the continued importance of software. He described how software will evolve in an environment that wisely balances desktop, Web, enterprise, and devices. Seems to me the “software vs. services” debate is semantic posturing. In either case we will still need engineers writing code that moves bits. “Consumer, consumers, consumers.” That quote and his discussion of consumers was the only part Steve’s talk that made me cringe and think they still don’t get it. In this day and age, no business should look at their users/customers as consumers. I agree with Matt Jones’s definition of consumers. The people who use our products are our partners, not mindless consumers. Empowering people to partner with us to make our products better is at the heart of Web 2.0. If Microsoft does not get this, they are going to have a tough row to hoe. Looking foward five years. Finally, perhaps the most animated and interesting part of his talk were his visions of the future of computing. They really were about services (supported by software) that reflected the pending convergence in media and technology. To paraphrase badly, he told a brief story envisioning a future when he is golf watching “TV” and shouts “Hey Bill, did you see Tiger sink that putt”. His intelligent “TV” would recognize that Steve wanted to say that to Bill Gates and would instantly find if Bill Gates was available for Steve. Bill’s “cell phone” would let Bill (sitting on a beach somewhere) know that there was a message from Steve and play the audio of Steve’s comment as well as the video of Tiger’s putt. Steve would respond, “that was nice – what kind of ball is he using?” Steve would rewind the video, zoom in on the ball, click it and get instant information about it and a link to buy it. He would tell Bill the brand and order two boxes for them. This was just one example of his crystal ball gazing – he also discussed ePaper and projectable surfaces. Enterprise 2.0: The New, New Knowledge Management? – Amen. Tom Davenport: “If E2.0 can give KM a mid-life kicker, so much the better. If a new set of technologies can bring about a knowledge-sharing culture, more power to them.” As I have stated earlier, E2.0 is simply better tools for KM. Original Content © Concerted Solutions, Inc.